An adaptation of a recipe from Cooking Light magazine, this dish can be either baked or barbecued. Delicious either way. In a large baking dish, combine the lemon juice, molasses, Worcestershire sauce, and garlic. Wash and dry the chicken thighs; dip them thoroughly in the marinade. Cover the baking dish and set in the fridge to marinate for 1 hour. For baking the chicken: Preheat the oven to 425 degrees. Sprinkle the chicken thighs with salt and pepper, then bake them in their marinade for 20 minutes. Turn the thighs over, then continue baking for another 10 to 15 minutes or until the chicken is done. For barbecuing the chicken: Heat up a gas or charcoal grill. 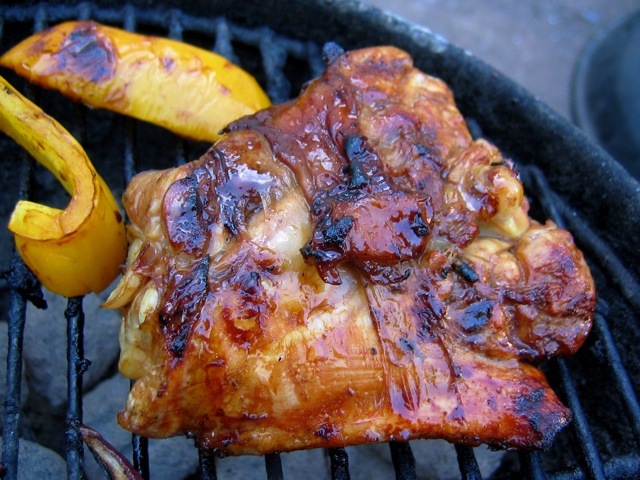 Remove the chicken thighs from their marinade; discard the marinade. Sprinkle the thighs with salt and pepper. Grill for about 8 to 10 minutes, turning occasionally, until the thighs are nicely charred on the outside and done on the inside.